I hate plug-in night lights. They scare me, bad (I have heard of house fires being associated with them and plugin airfresheners). So, my children usually sleep with a television on to calm their fears of the dark. Well, now with the Mobi GloMate plus I don't have to worry about that! I received a GloMate to review a few months ago, and I have to say it is FUN! I love that it is rechargeable, and it lasts a while off of a charge. 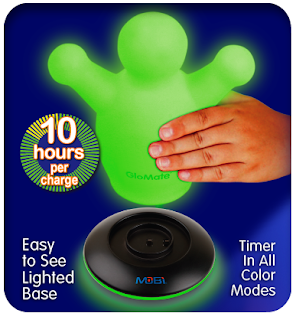 The GloMate is made up of a soft plastic, and it glows beautifully! These pictures were taken while the GloMate plus was on the rainbow setting and on the base. So pretty! There are settings on the GloMate that make you able to choose constant on, or a 15 minute auto dim, and four color choices- blue, green, red, or rainbow! The auto dim feature is great for putting kids to sleep with. GloMate plus costs about $20, being that it is reusable and rechargeable, I think it is well worth the money! No worrying about changing batteries, or running out of battery life! The GloMate plus is PVC free, and uses LED technology to have gorgeous, energy efficient light that never gets hot to the touch! My boys really like the GloMate, it is definitely a favorite. We keep the GloMate on the charging station at night, so all the children can enjoy the comforting light that it puts off. This light is also very helpful to the kids when they get up at night to go to the bathroom. The portability of the GloMate plus is extremely helpful for the little ones.The GloMate plus is simple to take off the charging station, and simple to put back on. Mobi also has excellent customer service and some fantastic other products that I recommend, such as Headphonies!